A mother and her newborn baby at the Maternal and Child Health Training Institute for medically needy in Dhaka, Bangladesh. Secretary-General Ban Ki-moon today highlighted the role that the private sector can play in contributing to improve maternal health services across the world through the United Nations Every Woman Every Child initiative. “We want to connect the private sector’s greatest strengths with the public sector’s greatest challenges,” Mr. Ban said at the Every Woman Every Child Taking Action Summit in New York. The Every Woman Every Child effort, launched in 2010, aims to save the lives of 16 million women and children by 2015 by mobilizing governments, multilaterals, the private sector and civil society to address the major health challenges facing women and children around the world. To date, Every Woman Every Child has brought together 260 partners and made ambitious commitments to advance its goal, and billions of dollars in new funding for women’s and children’s health have been mobilized and $10 billion has already been delivered. “Philanthropy can play a particularly important role as a catalyst for under-resourced and often neglected areas of women’s and children’s health that can be quickly made available for larger public and private flows,” Mr. Ban said. “Now is the moment for old and new partners to do more – because we are in a race against time,” he added, referring to the approaching 2015 deadline to achieve the anti-poverty targets known as the Millennium Development Goals (MDGs). The Summit was hosted by the UN Foundation, the MDG Health Alliance and JP Morgan. 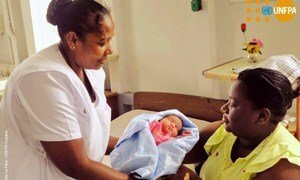 Midwives can make the difference between life and death for hundreds of thousands of women every year, the United Nations population agency affirmed today, recognizing their crucial role in improving maternal health, family planning and assisting during humanitarian emergencies.